Stories of Pit Bulls saving their pet parents from attacks really aren’t that unusual, although you’d never know it from the news media, which generally prefers to report only negative stories about these misunderstood dogs. 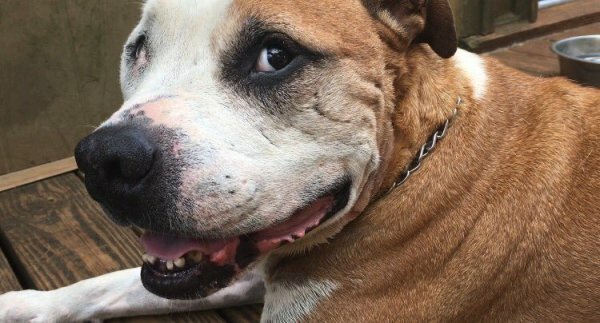 Last week, a 7-year-old stray Pit Bull in Baldwin, Ga., saved a life — not of a family member, but of a total stranger when he got between a man and the woman he was attacking. The man stopped attacking the woman, but he stabbed the Pit Bull five times. Hero almost didn’t make it through surgery, but he managed to pull through. “He has had a really rough life,” Carla Welch, founder and director of the Fighting for the Bullys rescue organization in Knoxville, Tenn., told WATE. Welch started an online fundraising page that raised the money for Hero’s veterinary care. Despite Hero’s ordeal, Welch said he is very mellow and social. “He has had a bum back leg and a bum front leg, but he gets around fine and he’s looking for a good friend,” she told WATE. If you’ve been holding out for a Hero, this sweet dog is almost ready for a loving forever home. You can find more information about adopting this special guy on Petfinder.com. A big thank you not only to Hero, Clay, Seely and Welch, but also to WATE and WBIR for reporting this positive Pit Bull story. Here’s hoping more news outlets follow your awesome lead.